In a review meeting on the preparedness of the 5th Northeast Connectivity Summit to be held in Tawang, Arunachal Pradesh Chief Secretary Satya Gopal has asked the Federation of Indian Chambers of Commerce and Industry (FICCI) Director Biswajit Chakraborty to raise the bar of the event to be organised by the State Government in collaboration with FICCI. The summit, scheduled to be held on November 14-15, carries the theme ‘Sustainable Tourism’. The first such summit was held in Guwahati in 2014. 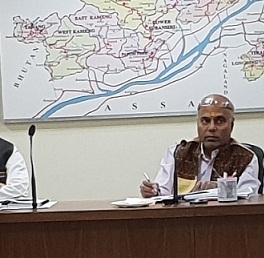 During the review meeting, Chief Secretary Satya Gopal gave some of his viewpoints for successful and fruitful conduct of the ensuing summit and hoped that there will be tangible results during and after the summit. He said that the participation of renowned industrialists in India will bring about the desired attention to Tawang from all the interested and prospective investors in the country and abroad. The State Chief Secretary wished to see maximum participation from the heads from Central Government departments and from the Northeast States. He assured of providing all support and assistance for a fruitful and successful conduct of the summit. The summit will witness participation from renowned, established, and start-up and budding entrepreneurs. There will be participation from Bhutan, Thailand, Japan, and South Korea, and influencers, think tanks and experts from India and abroad who will share their knowledge and experiences. Commissioner Finance, Commissioner Industry, Secretary to CM and officers of the departments concerned attended the meeting.